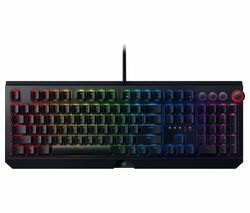 Boasting fully programmable keys, mechanical switches and multi colour backlit keys and an ergonomic design, our impressive collection of Razer Keyboards will allow you to enjoy the ultimate gaming experience. 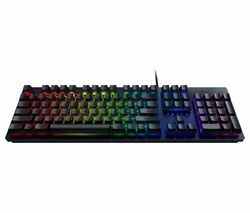 Within our Frazer keyboards range you will find a huge variety of models including the Razer BlackWidow Chroma V2 Mechanical Gaming Keyboard, Razer Ornata Chroma Mechanical Gaming Keyboard and the Razer BlackWidow Chroma V2 Stealth Mechanical Gaming Keyboard. Allowing you to enjoy your favourite games like never before, a Razor keyboard really should be your first port of call. Boasting a number of customisable functions including the option to alter your gaming keyboard to suit your mood and gaming style, all of our gaming keyboards will allow you to enjoy comfortable gaming sessions that meet your requirements. 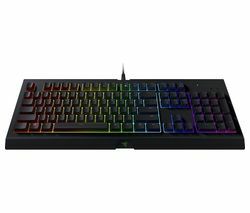 One of the most popular gaming keyboards in this collection includes the Razer Ornata Chroma Mechanical Gaming Keyboard. 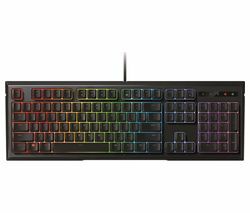 Offering top features such as Razer Mecha-Membrane that makes every key stroke count, mid-height keycaps for fast responses, chroma customisable lighting for a unique gaming experience and an ergonomic design for longer play, this keyboard will allow you to remain focused on every game. So, no matter how frantic the action gets during your gaming marathons, you can rest assured that you can remain in control. And to ensure that you always have the best possible choice, we also offer a wide range of wireless keyboards too. Available in a variety of different models, all of our wireless keyboards offer exceptional performance, versatility and functionality. Of course, if you have any questions about any of our gaming keyboards, please do not hesitate to get in touch. Our friendly and helpful team is always on hand to point you in the right direction when it comes to ensuring you find the right product for your individual gaming needs.